The announcement by the Seattle retail giant comes amid pressure on the private sector by the incoming Trump administration to create jobs. Amazon.com said it plans to add 100,000 full-time U.S. employees to its ranks over the next 18 months, a move that comes amid pressure on the private sector by the incoming Trump administration to create jobs. Seattle-based Amazon said Thursday that by 2018 it plans to have more than 280,000 full-time U.S. employees, compared with 180,000 at the end of 2016. The jobs cover a wide range of disciplines, from developers and engineers who work on cloud computing to the burgeoning armies of lower-paid warehouse operators who handle millions of packages in states like Texas, California, Florida and the Midwest. The company also highlighted its role as a platform for third-party providers that use its online site to sell wares and also create jobs, as well as a revenue generator for contractors who sign up with the e-commerce giant to deliver packages. Marketplace, Amazon’s online platform for third-party merchants, supports 300,000 jobs in the U.S., the company said. “Innovation is one of our guiding principles at Amazon, and it’s created hundreds of thousands of American jobs. These jobs are not just in our Seattle headquarters or in Silicon Valley — they’re in our customer-service network, fulfillment centers and other facilities in local communities throughout the country,” Amazon CEO Jeff Bezos said in a statement. “We plan to add another 100,000 new Amazonians across the company over the next 18 months as we open new fulfillment centers, and continue to invent in areas like cloud technology, machine learning and advanced logistics,” Bezos said. A hiring binge by Amazon is nothing new: The company has grown dramatically since its humble origins as an online bookstore, adding 150,000 U.S. jobs since 2011. It is well on its way to becoming the second-largest employer among the Fortune 500, after archrival Wal-Mart. As of last fall, Amazon had 306,800 workers around the world, not including temporary hires and contractors. The bulk of these jobs are in warehouses and other logistics activities, but highly paid tech and corporate jobs have been growing quickly too. According to a paper released Thursday by the Progressive Policy Institute, a Washington, D.C., think tank, Amazon last year became the fastest among U.S. companies to reach the 300,000-worker milestone. What took General Motors 32 years, and AT&T 27 years, Amazon did in 20. In Seattle, where Thursday it advertised more than 9,000 jobs, the company has transformed not only the labor market but the urban landscape. Amazon said Thursday it had more than 40,000 employees in Washington. But the disclosure of its massive, near-term full-time job projections in the U.S. is novel for the e-commerce juggernaut. It seems to fit within the context in which President-elect Donald Trump lambastes, often via Twitter, companies that take jobs out of the U.S. and praises those companies that create them. Earlier this week, Trump met with Jack Ma, CEO of Alibaba, Amazon’s China-based rival.According to media reports, they discussed how Alibaba can help entrepreneurs in the U.S. create jobs by exporting products to Asia. Amazon’s growth contrasts with a big retrenchment among major brick-and-mortar-based retailers such as Macy’s, which have seen their business buffeted by the growth of the Seattle e-commerce giant. The nonprofit Institute for Local Self-Reliance says the tech firm has destroyed more jobs in the wider retail sector than it has managed to create in its warehouses. “What Amazon’s announcement really shows is how fast the company is growing, and that’s bad news for U.S. workers, who stand to lose more than they gain as Amazon increasingly dominates commerce,” ILSR co-director Stacy Mitchell said in a statement. Amazon shares rose 1.83 percent after the announcement, closing at $813.64. Federal and state officials cheered Amazon’s news. Texas Gov. Greg Abbott said on Twitter that many Amazon jobs will come to the Lone Star State. The press team of Sen. Mitch McConnell, R-Ky., called it “great news” for Kentucky jobs via Twitter, too. Amazon, like other U.S. retailers, announces each year how many seasonal workers it hires during the holiday season. The shopping frenzy that concluded in December saw a surge of 120,000 temporary workers, a sizable fraction of whom were expected to stay on as full-timers. 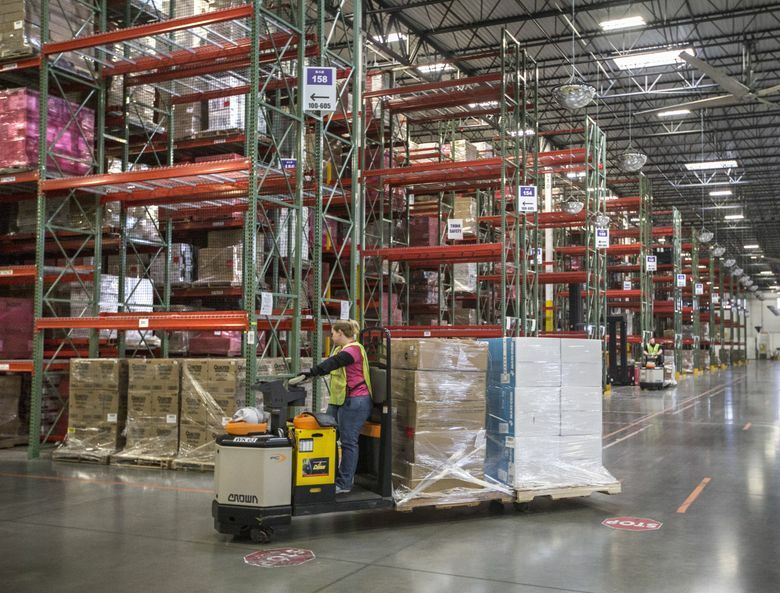 The company also talks about jobs at a local level when it’s opening fulfillment centers. Its most similar recent statement about American jobs came in July 2013, when the company said it was creating 5,000 new full-time jobs across its warehouse network in the U.S.
Thursday’s announcement has more in common with how Amazon touts its job-creating potential in Europe, a region where the company is dealing with tax and antitrust investigations, suspicious governments and hostile unions. In early 2016, Amazon trumpeted its “new job creation record” of 10,000 permanent new jobs in the Old World the previous year, promising “several thousand” more across a wide range of operations. Amazon’s louder tune underscores how the new U.S. administration, led by a boss given to mercurial blasts, will bring new political-risk challenges to corporate America. Blazing tweets from the president-elect singling out companies from GM to Boeing have swung stocks and caused fretting in board rooms. Trump’s internet-conveyed wrath is particularly focused on companies he perceives as exporting U.S. jobs, a common theme during his presidential campaign. Trump, who is not scheduled to occupy the White House until the end of next week, hasn’t hesitated to take credit for some corporations’ job-creating moves. In Amazon’s case, the political waters of the Trump era are further muddied by public spats between Trump and Bezos, the CEO. During the campaign, Trump complained about Amazon having a “huge antitrust problem.” He also accused Bezos of buying The Washington Post, which aggressively covered Trump, to help Amazon avoid taxes. Moreover, Trump campaigned against globalization, the same phenomenon that helped Amazon quickly become a world empire. When Trump won, Amazon shares took a hit, while the wider market rallied. Colin Sebastian, an analyst with Baird, wrote in a note that Amazon’s announcement shows that the company will continue to invest aggressively in retail, media, technology and logistics rather than in padding its profits. While the timing and the details offered by Amazon may gain some “political capital” with the new administration, it’s unlikely that it means a shift of employment from Amazon’s international operations toward the U.S., Sebastian wrote. “We expect the pace of hiring internationally to accelerate as well,” he wrote.